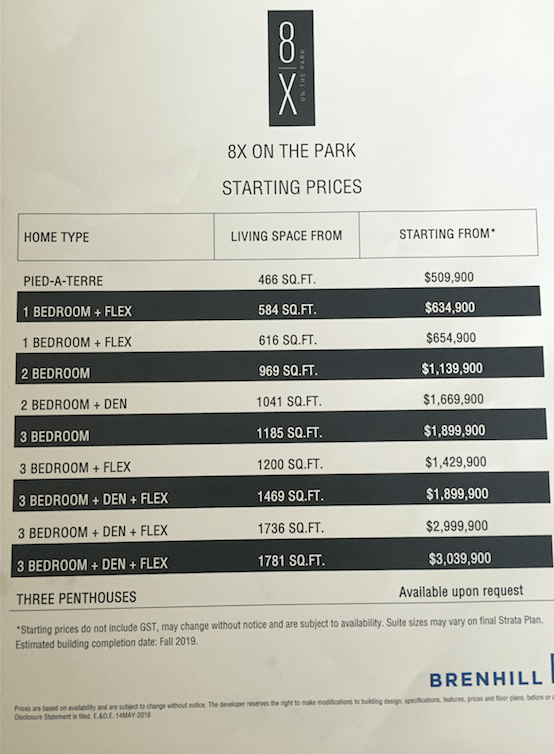 8X On The Park prices were revealed at their public preview on Saturday May 14. The lineup at their sales centre at 1149 Hamilton street was incredible. People waited about 45 minutes in the hot sun just to get the opportunity to cram inside and walk through some of their preview units. 3 penthouses available, prices upon request. Something to note, the first 11 floors of 8x On The Park will be designated rental units only as per their agreement with the city of Vancouver. Therefor starting prices you see would start on the 12th floor and upwards. Prices increasing from $5000-10,000 more per floor. Also you do not have to pay 5% GST on newly built developments up to $750,000 as per new BC government changes. Anything over $750,000 will be subject to GST, prices above do not include GST. Sales start Tuesday May 17, 2016. Get there early as there is surely going to be a lineup!